Four hours before dawn, all remains eerily still on a sleepy little farm in rural Thailand. The cows have long since dozed off and even the roosters are completely silent. Yet Nop Gai Sang Sii, age 46, awoke at 2:30 AM to begin preparing for her long trip from her village of Nong Poo Nuai to the Green Market in the city of Yasothon. While the rest of the country has just begun to enter a deep sleep, Nop Gai (nicknamed Noi) has already sacrificed any hopes of ample sleep and leisure time in order to successfully make a living engaging in one of the most demanding professions human history has ever known; such is the life of the organic farmer. The trials endured by Noi and her husband Brat Chuan are a reoccurring theme seen throughout the region of Isaan in northeastern Thailand. Both dropped out of school after graduating the 4th grade to work on family farms and have labored endlessly thereafter. After meeting 38 years ago and having three children of their own, the lives of Noi and Brat Chuan have at last become stable and secure, a dramatic change from years past. 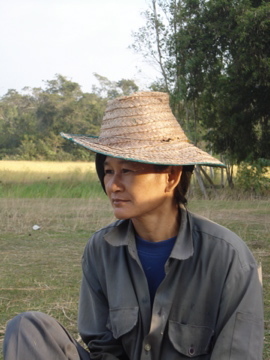 Before owning any land of her own, Noi worked as a rice farmer during the rainy season and migrated to Bangkok for work during the off-season. Her work experience is nothing short of impressive; Noi has worked as a construction worker earning 200 baht (less than six U.S dollars) a day. She has sold fruit on the crowded city streets of Bangkok for less than 100 baht a day. She has labored in a can factory and picked coconut and corn as a day laborer. Even when she was finally able to purchase 15 rai of land (6 acres) with her husband for rice cultivation, the pressure to earn a sufficient income only became greater. 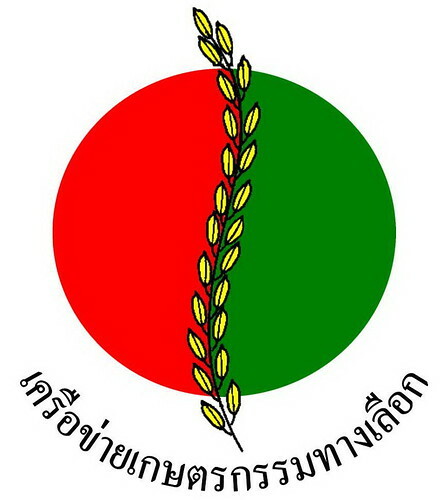 They have since invested a total of over 100,000 baht into developing the land and are still 30,000 baht in debt. To complicate matters further, two of their three children have moved to Bangkok working in jewelry and steel manufacturing, but have yet to send a single baht back home despite initial pledges to help payoff the costs of the family farm. Like so many of the small farmers in Isaan bogged down by debt, Noi and her husband were desperate for financial relief and better times. A savior would come, but in the most unexpected of places. Sixteen years ago, Noi and Brat Chuan were approached by members of a Thai NGO representing a network of small organic farmers in Isaan. They presented the couple with a plan to switch over from chemical agriculture to organic farming. While the risks of suddenly switching from chemical to organic were quite evident—including potentially lower yields and the need for an even higher work ethic—the benefits of switching were even more obvious. By becoming self-sufficient and producing their own organic fertilizer, Noi and Brat Chuan would no longer have to invest a large chunk of their earnings into purchasing highly expensive chemical fertilizers. By learning about organic methods of pest control, the amount of money spent on pesticides and herbicides would be drastically less than before. Additionally, the financial benefits of abstaining from using harmful chemical fertilizers and pesticides carried over as vital health benefits as well. With little to lose and so much to gain, Noi and her husband decided to take the biggest chance of their lives. As organic farmers, Noi and Brat Chuan immediately disposed of the industrial fertilizers in favor of compost and manure generated by their own cows and buffalo. They learned how to utilize vegetable oil on their crops as a pest deterrent. In addition to cultivating rice, the couple expanded their gardens and began to raise much higher quantities of fruits and vegetables. The risk paid off in spades: not only were they getting much higher yields from their rice patties, but they were generating surpluses of organic foods which they could sell for profit. Noi began to make the long trip every Saturday morning to sell her goods at the Green Market in Yasothon, sometimes making over 1,000 baht at a time. Now fully engaged in a system of self-sufficiency, Noi had no reason to find outside work in an urban environment during the rice off-season. She is now committed to spending the dry season fertilizing her land via organic means and raising and selling a wide variety of crops on the side. Now able to comfortably devote over 5,000 baht a year to her debtors, Noi expects to be finally debt-free in five to six years. When asked whether she felt regretful that two of her children had left her in her time of greatest need, Noi simply smiled and shook her head: “I am a little sad that they left, but I am more than happy they were able to find good jobs in the city and live good lives. The city is simply not for me. There is no sense of community in Bangkok like the one we have here in Nong Poo Nuai. This is where I belong.” Noi and her husband are not alone. More and more farmers in Isaan, the poorest region of Thailand, are switching to organic farming to improve not only their standards of living, but the standards of their lives.